One of Gloucester Road’s most passionate advocates said that she got a tear in her eye when a project that she has been planning for more than four years finally came to fruition. Thirty-one banner flags featuring 62 images from local artists can now be found along Gloucester Road from the Memorial Stadium to the arches, as well as one on Zetland Road and three on Cheltenham Road. “I’m just so chuffed,” said Sarah Thorp of Room 212, a shop which sells the work of many of the artists whose designs now feature on the banners. 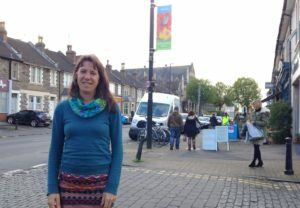 More than 150 artists submitted ideas for the banners, with the winning designs chosen by Sarah in consultation with other traders along the road. Funding came from the former Bishopston, Cotham & Redland Neighbourhood Partnership. The banners have been installed in time for the North Bristol Art Trail, taking place on November 25 and 26.